Blast nozzles accelerate the air and abrasive as the mixture exits the end of the blast hose. The taper and length of the nozzle’s inlet and outlet determine the pattern and velocity of the abrasive exiting the nozzle, while the composition of the liner material determines its resistance to wear. When choosing a nozzle, you must take a number of things into consideration. Choosing the correct nozzle is dependent on the amount of air available in cubic foot per minute (cfm), the capacity of your blast machine (as well as the inner diameter (ID) of its piping), and the varying types of blast and air hoses. 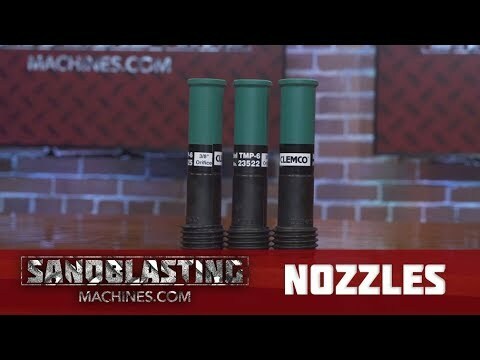 Disproportionately-sized nozzles will result in an inefficient blasting. Often used in high production blasting at a distance of 18 to 24 inches for hard-to-clean surfaces (or 30 to 36 inches for loose paint and soft surfaces), Clemco’s long-venturi nozzles—TSP, TMP, TXP—are the industry standard. For blasting distances under 18 inches, we recommend a short-venturi nozzle (CT). Additionally, nozzle models TMP and TXP have Clemco-exclusive contractor mounting thread that is wider than the standard 1-1/4” nozzle threads which help prevent dust, dirt, and abrasive particles from getting stuck in the nozzle. All blast machine parts and accessories must be chosen carefully to ensure optimal productivity and safety, as well as lessening the frequency to which you will need to replace certain parts. If you have any questions about which blast nozzle is right for your blast machine setup, please feel free to call our experts using our toll free number: 1-855-358-2858. Feel free to check out our Nozzle Size Chart!